Former Ukrainian Prime Minister and People's Front party leader Arseniy Yatseniuk has discussed the Ukrainian State Fiscal Service reform and continuation of cooperation with the International Monetary Fund (IMF) with United States Secretary of Commerce Penny Pritzker and U.S. Secretary of Treasury Jacob Lew in Washington. "I have held two meetings, with the U.S. Secretary of Treasury and the U.S. Secretary of Commerce. I will start with the secretary of commerce. Last year we signed a plan of action to attract American investments in the Ukrainian economy. 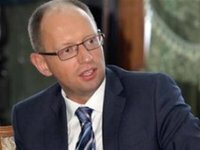 We have achieved many great things under this plan," Yatseniuk said in a video published on his Facebook account. The former prime minister recalled that the Verkhovna Rada has already adopted a law on state procurement, the privatization process has been initiated, changes to the State Fiscal Service have been introduced, income tax has been decreased and deregulation has been conducted as well. "Our roadmap with the U.S. demands further implementations. At first, it is also deregulation, and the main point the secretary of commerce and I focused on was the reform of the State Fiscal Service, and most importantly, of the customs service. The American government assigns funds and grants technical assistance in customs reforms. [This is done] for the purposes of fighting corruption there, simplification of customs procedures and making Ukrainian taxation laws and the tax service more approachable to Ukrainian taxpayers, just as it is in the U.S.," he said. He said that the U.S. support of the Ukrainian government in the customs and tax service reforms has not only been announced, but the funds and relevant team have been devoted to it. Yatseniuk also thanked Pritzker for her kind words. "We will never give up our obligations to Ukraine to see it independent and wealthy," Yatseniuk cited her as saying. As for the meeting with U.S. Secretary of Treasury Jacob Lew, he said that it was focused on the continuation of Ukraine's cooperation with the IMF. "Tomorrow I will have a meeting with the IMF for the Ukrainian parliament and Ukrainian politicians to display their devotion to reforms not with words but by adopting relevant laws, as we have done two years in a row," he said. He noted that the American government has helped and will continue to help Ukraine, but that everything depends on Ukrainian politicians' further display of their devotion to reforms.